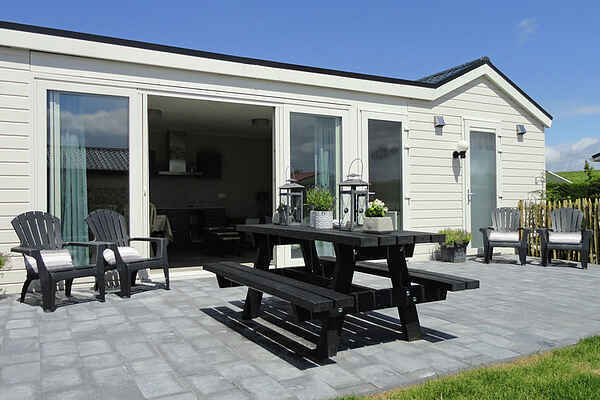 This charming chalet is situated in a holiday park, directly on the beach of Oosterschelde. Your holiday bungalow is on one floor so also perfect for the disabled. The living room has a modern interior and the sunlight makes it very bright. Both bedrooms have a private shower cabin, sink and toilet. From the bungalow you can reach the beach and cosy centre of Sint-Annaland in no time. The immediate vicinity also has plenty to offer. Historical towns like Zierikzee and Nieuwerkerk are certainly worth a visit, as are the world famous Deltawerken. Be pleasantly surprised by the gorgeous countryside and discover a unique part of Zeeland through the numerous cycling and hiking trails which can be followed in the direct vicinity of the house.